The festive season is all about family, friends and celebrations that often centre around food. Olive oil is a fundamental ingredient that brings beautiful cooking together and is a staple on the dining table. 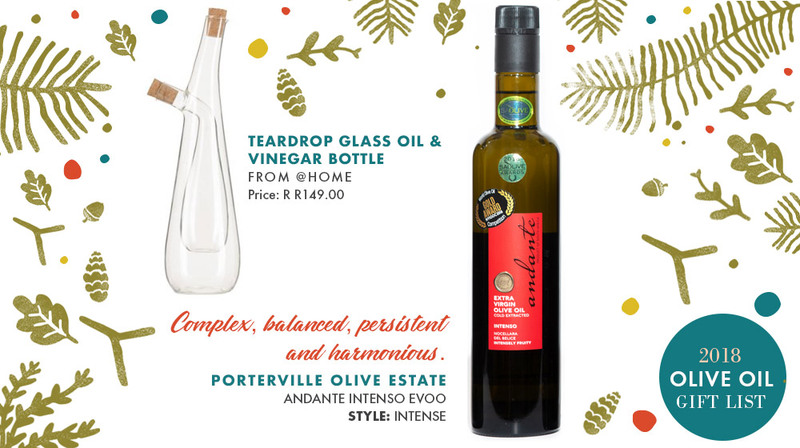 Olive oil also makes a great gift and in South Africa, we’re lucky enough to be producing some of the best. 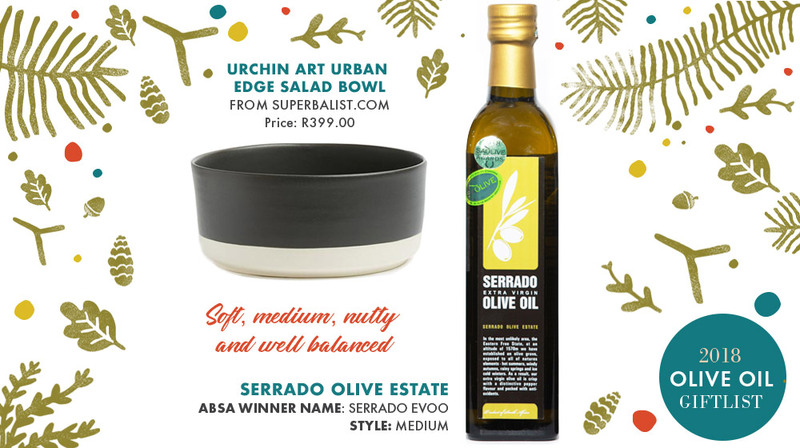 To give you some ideas of what and how to gift, we’ve listed the ABSA Top 10 Olive Oil winners for 2018 plus accompanying pressie ideas – this is our olive oil gift list for 2018. This gorgeous intense extra virgin olive oil has a balanced bitterness with a long tingling green-chilli finish. It’s tasting notes comprise of fresh green herbaceous aromas and flavours of artichokes, rucola, green tomato and fresh walnuts. Complex, balanced, persistent and harmonious. A superb finishing olive oil atop grilled meats and green vegetables, game, rocket salad, tomato-based pasta dishes, pulses and stews. Where to Buy: Online at andanteoliveoil.co.za, The Olive Branch Deli; Giovanni’s; Woolworths. We can’t think of a better companion to this sublime finishing oil than this timeless teardrop olive oil and vinegar bottle, synonymous with Andante’s sleek style. The perfect vessel for housing this intense olive oil ready for pouring in style at the table. 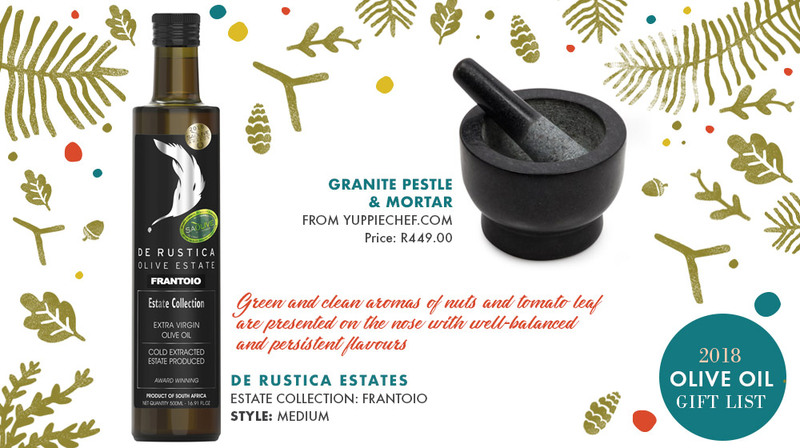 De Rustica’s EVOO is characterized by fruitiness of mild intensity, with herbaceous notes of unripe tomato and green banana. Fresh and clean taste, it opens with a slightly sweet sensation followed by a pleasant bitter and spicy charge of medium intensity, persistently rich in vegetable notes dominated by tomato. A medium intensity olive oil that is best paired with chicken and fish dishes, pasta, salads or drizzled atop soups just before serving. A Pestle & Mortar is always a great gift to bestow on anyone who loves to cook. 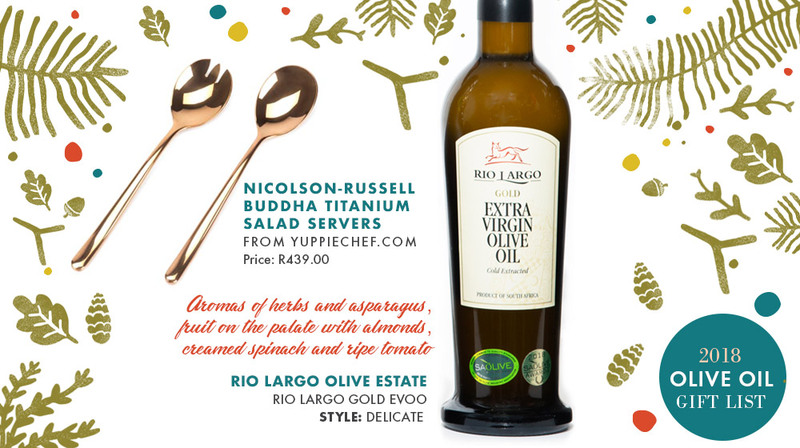 Pop this prezzie in your bag together with De Rustica’s EVOO for a lovely duo that can sit on the kitchen counter side-by-side. Perfect for making delish pestos that you can liberally spoon onto fresh pasta. The oil for the 2018 Directors Reserve was minimal due to the drought, but bold and intense in flavour with the result deemed the best Intense blends to date. The Directors Reserve contains good bitter fruitiness balanced by a lingering spiciness with hints of green apple, artichokes and freshly cut grass. This is a perfect table oil delicious poured over salads, fresh pasta or used to make homemade ice cream like this White Chocolate Macadamia Nut No-churn Olive Oil Ice Cream Sundae. 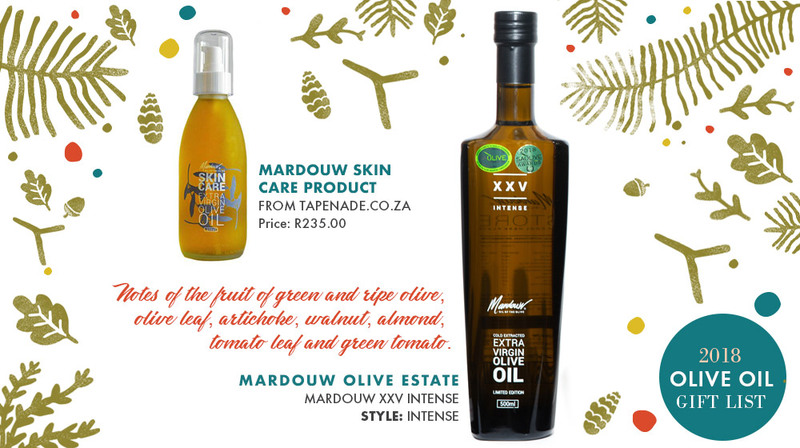 Where to Buy: Online at marbrin.co.za; on-site at Marbrin Farm, Klaasvoogds East, Robertson. Selected deli’s, including Giovanni’s, Chardonnay Deli, Camps Bay Continental, The Food Barn, Olive Branch Deli and at Café Luxe in Paarden Eiland. This marble and wood two-tone board is a fitting gift to be displayed alongside Marbrin’s Directors Reserve. Perfect for when entertaining guests, use this snazzy board to serve your favourite cheeses with slices of fresh bread to mop up all that gorgeous Marbrin olive oil. See how to put the perfect cheeseboard together here. 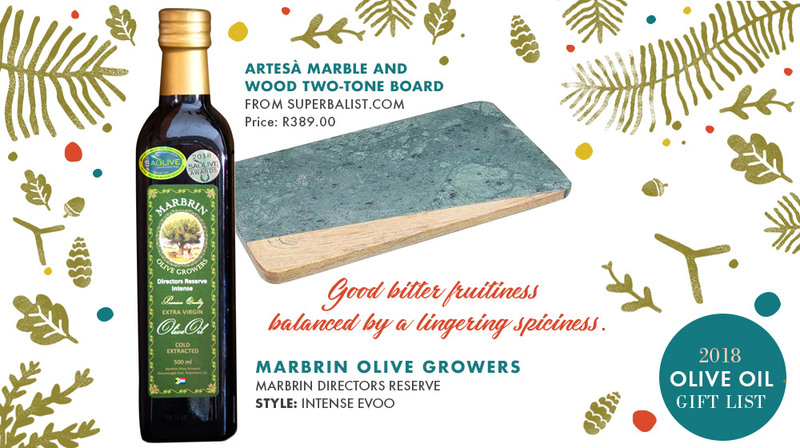 This well-balanced intense EVOO displays tasting notes of the fruit of green and ripe olive, olive leaf, artichoke, walnut, almond, tomato leaf and green tomato. Mardouw is perfect served over fresh green salads, pasta, and drizzled liberally over freshly baked ciabatta. Nourish yourself from the inside out by pairing your XXV with Mardouw’s orange-infused olive oil for the skin. This sumptuous skincare product is full of the good stuff and proficient in the prevention and treatment of stretch marks and ageing. A great gift combo. Oakhurst olive oil is a blended medium intensity olive oil with a pleasant bitterness and pungency. It has subtle fruity notes with hints of a peppery finish and flavours of artichoke and nuts. This EVOO is best paired with vegetables, fresh pasta, chicken and fish dishes, or sautéed and slow roasted meat dishes such as lamb shanks. This decadent truffle trio is a smashing gift for the lover of pasta in your life. 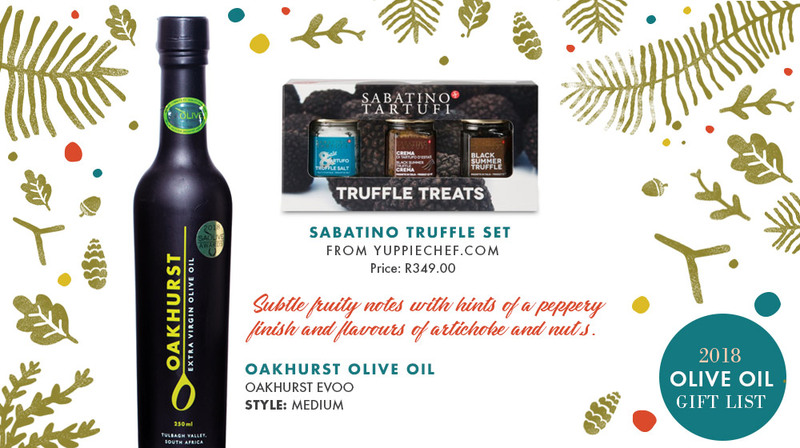 Gift your carb king or queen with this set of truffle salt, black summer truffle cream and whole summer truffles along with Oakhurst’s Olive Oil for a truly delish Christmas spoil. Perfect for making the ultimate bowl of homemade pasta. The Breede River Valley climate can be harsh and inhospitable – but the olive oil created here is soft, fruity and delicate – a wonderful companion to hearty meals and warm hospitality. Olyfberg’s delicate olive oil has a lovely light golden yellow colour together with a fine and complex aroma with elegant nuances of freshly cut grass, artichoke, lettuce and celery with a hint of basil. Olyfberg’s EVOO is excellent for drizzling over fresh bread, bean soups, grilled vegetables and meats. Where to Buy: Boord Spar; Paul Roos Kwik Spar and De Jonker Kwik Spar Stellenbosch, Lion Square and Yonder Hill Somerset West, Robertson Spar, Affie Plaas Padstall Robertson, Van Loveren Tasting Room Robertson, Four Cousins Robertson, all the Garden Route Agri Marks and Rooiberg Kelder. 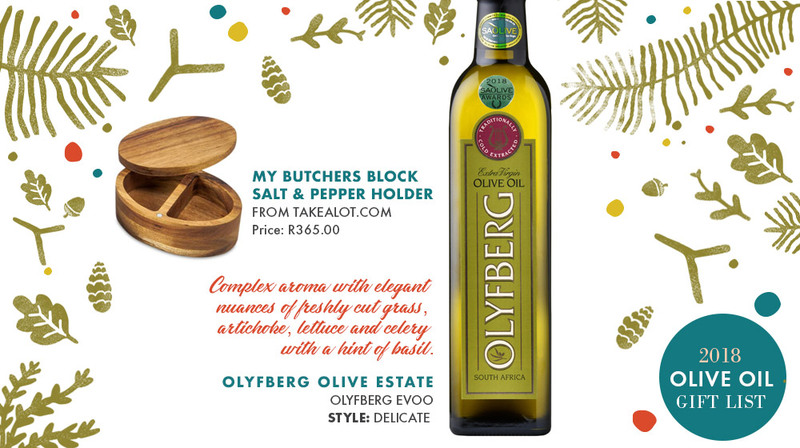 This gorgeous salt and pepper holder is designed to serve your seasonings in style – the ideal gift to give along with a bottle of Olyfberg olive oil. They’ll both look great at the centre of a table when entertaining guests. A delicate extra virgin olive oil with aromas of herbs and asparagus, nice fruit on the palate with almonds, creamed spinach and ripe tomato. A delicate and balanced hint of bitterness and elegant subtle pungency to conclude in a smooth, balanced and fresh oil. Rio Largo can be used to add flavour to all foods, specifically drizzled over salads, fresh bread, vanilla ice cream and with soups and white meat. Where to Buy: Woolworths, Checkers, select Spars, Yuppiechef, La Marina Foods and Wild Peacock or simply from the estate. A delish serving of salad drizzled with Rio Largo EVOO deserves to be served up with something just as pretty. We suggest adding these salad servers to your Christmas gift bag – how beautiful are these titanium sally-servers? A soft, medium, nutty well-balanced EVOO. Serrado displays tasting notes of green and ripe olives, mint, herbs, almonds, walnuts and pine seeds. Serve your Serrado with toasted homemade sourdough bread, rubbed with roasted garlic and drizzled with a generous helping of Serrado EVOO. Where to Buy: Online Selected Spars and delicatessens in the Free State, as well as Woolworths for a limited period in 2018. Say hello to summer when you serve a delicious salad in this sleek and subtle two-tone salad bowl. A great gift to give with a bottle or two of Serrado olive oil. The Mission variety olive oil is mild and gentle with finely balanced tasting notes of fresh grass, avocado, butter lettuce and Granny Smith apple. Tokara’s Mission EVOO is best served with fish, cheese soufflé, salads and vegetables. Where to buy: Online and at Checkers & Spar. 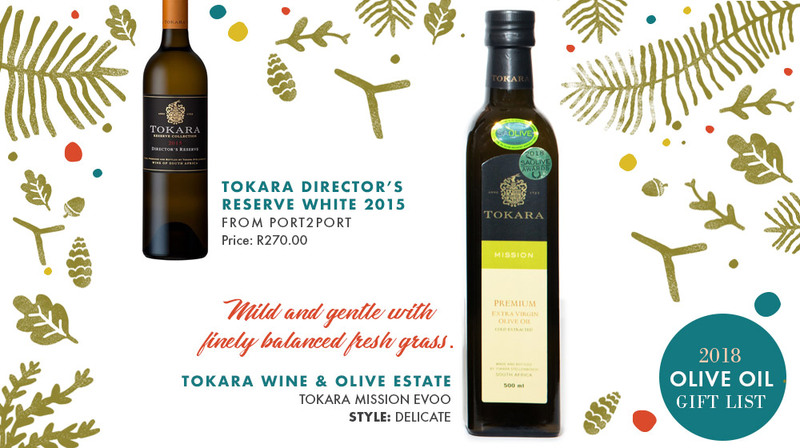 Gift your olive oil alongside a bottle of Tokara’s Director’s Reserve White – a delightfully complex wine on the nose with notes of baked apples, ripe quince and passionfruit with hints of lemongrass, toasted almonds and freshly baked brioche. A decidedly decadent white wine to serve with a delicious summer salad drizzled with Tokara Mission EVOO. By carefully blending the oils from three cultivars, Zoetigheyd farm produces a mild and an intensely flavoured olive oil. Green and clean aromas of nuts and tomato leaf are presented on the nose with well-balanced and persistent flavours with overall bitterness and pungency. Zoetigheid is well-paired with Southern European cuisine. Beautiful salads and ciabatta beg to be drizzled and dipped into this medium intensity extra virgin olive oil alongside a perfectly chilled glass of white wine. 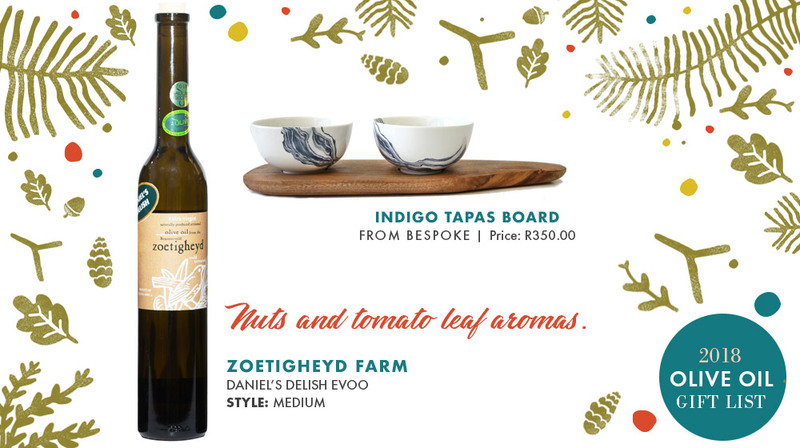 This tasteful Indigo Tapas Board from Love Milo is the perfect present to give together with your Zoetigheid olive oil. The two bowls are a fitting size to be filled with olive oil and balsamic for dipping chunks of fresh, crusty bread served out of the oven.